LOT Polish Airlines (www.lot.com) and Ryanair (www.ryanair.com) operate domestic flights. There is a comprehensive network linking all major cities. As in most European countries however, the train system is fairly comprehensive (at least between cities), and goes from centre to centre obviating long trips to and from airports. From Warsaw to Cracow is 50 minutes, to Gdańsk is 1 hour 5 minutes and to Wrocław is 1 hour 10 minutes. Most airports are a manageable distance of between 10 and 20km (6 and 12 miles) from city centres, with the exception of those at Szczecin and Katowice. When driving in Poland you need to keep your wits about you; this can be quite a trying place for motorists, especially along country roads and at night. Road quality ranges from smooth brand-new motorways to narrow, pot-holed single lanes, with horse-drawn carts, tractors and other agricultural machinery in abundance. Major inter-city routes use the prefix 'E' and motorways use 'A'. Most petrol stations located along international routes are open 24 hours a day. Self-drive cars are available at the airport or through various car-hire offices in town centres. All major firms are available. The minimum age for hiring a car is 21; some go as high as 23 or even 25. Taxis are easily available and not too expensive in towns and cities. Hail them on the street or go to a postój taksówek (taxi stand). Avoid unlicensed pirate (called ‘mafia’ in Poland) taxis. 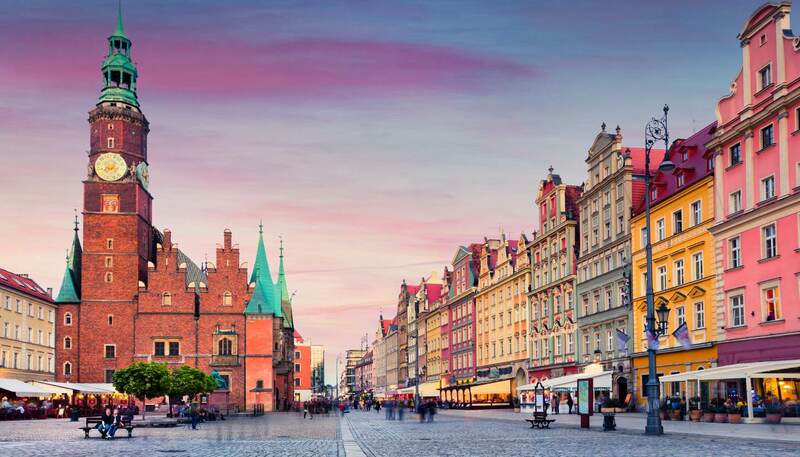 Poland is a great place to get around by bicycle as most of the country is fairly flat and you can put your bike on the train to cover long distances more quickly. Dedicated cycle lanes are few and far between in most cities outside Warsaw, Cracow and Wrocław, but growing. Poland has a comprehensive bus network run mostly by Polonus (tel: 703 403 403, in Poland only; www.pkspolonus.pl) that links up even the smallest village connected by road. But buses are useful on short routes only; trains are always quicker and more comfortable. The minimum driving age is 18. Speed limits are 50kph (31mph) in built-up areas, 90-100kph (56-62mph) on main roads and 120-140kph (75-87mph) on motorways. Seat belts and warning triangles are compulsory. Trams have the right of way. Headlights must be switched on at all times. For roadside assistance, contact the Polish Automobile and Motorway Federation, Polski Związek Motorowy (PZM) (tel: 19637, in Poland only; www.pzm.pl). Tourists travelling in their own cars should have vehicle registration documents, their national driving licence (driving licences of EU nationals are accepted) and third-party insurance documents. Green Card motor insurance is necessary for vehicles coming from outside the EU and Switzerland. An International Driving Permit is required for those from outside the EU. The legal blood alcohol level is 0.2% so it’s best not to drink at all when driving in Poland. Warsaw: In Warsaw, the Municipal Transport Board (ZTM) is responsible for the bus, metro and tram services. ZTM tickets are valid for all services and can be purchased as a single ride or as a day, week or monthly pass. Some buses allow the purchase of tickets on board but require exact change; it is best to buy before you use any transport. Cracow: The MPK is the transport board responsible for public buses and trams in Cracow and the system works similarly to the one in Warsaw, except there is no metro. Public transport tickets are available in all towns at green Ruch (traffic) kiosks, hotels and post offices. Most public transport operates from 0500-2300; night buses, in the major cities, run from 2300-0500. Taxis are available in all main towns. You can usually find them at ranks or order them by phone. There is a surcharge (rate 2) from 2300-0500 and for journeys out of town, as well as at weekends. Taxi drivers are not normally tipped, unless the driver has been helpful and/or the journey seamless. Polskie Koleje Państwowe (PKP; Polish State Railways) (tel: 19757, in Poland only; www.pkp.pl) operates cheap and efficient InterCity trains and links all parts of the country in a network radiating from Warsaw. There are two classes of travel (1st class is 50% more expensive then 2nd) and trains are often classified as InterCity, express, ‘fast’ and ‘ordinary’ (or local). For comfort and speed stick to InterCity (IC) or express (Ex) routes. All large train stations have left-luggage rooms open round the clock where you can store your bags for up to 10 days. InterRail One-Country Pass: offers travel for three, four, six or eight days in one month within Poland. Travel is not allowed in the passenger's country of residence. Travellers under 26 years receive a reduction. Children under 12 travel free when accompanied by an adult using an Adult Pass. Supplements are required for some high-speed services, seat reservations and couchettes. Available from Voyages-sncf.com (www.voyages-sncf.com). Eurail Poland Pass: offers travel for three, four, five or eight days in one month within Poland. Available to non-EU nationals from Eurail (www.eurail.com).